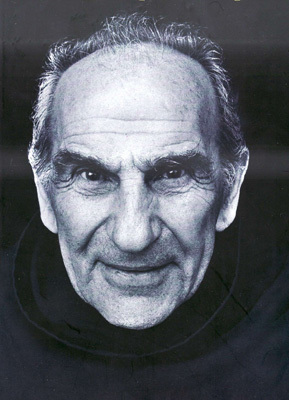 Zef Pllumi (1924-2007) was born in Mali i Rencit near Shkodra and joined the Franciscan Order. As a twenty-year-old, he witnessed the Communist takeover and the unprecedentedly violent suppression of the Catholic Church in northern Albania. Most clergymen were arrested and many were executed. Though he suffered much abuse, Pllumi managed to survive and was ordained in 1956. He worked as a parish priest in Shosh in the mountains of Dukagjin for some twelve years until 1967, when a government edict was issued for the total abolition of religion. He was arrested at that time and spent the following twenty-three years in prisons and labour camps. His harrowing experience as a Catholic priest in Stalinist Albania is recorded in his moving, 730-page memoirs, "Rrno vetëm për me tregue" (I only live on to tell), Tirana 2006, of which an extract is given here. Father Zef Pllumi died in Rome on 25 September 2007. The national holiday, 28 November 1944, was a cold, sombre day, perhaps the most sombre one since the declaration of independence. Since childhood, we had celebrated that day with lights, colour, songs, lots of noise and the waving of flags. The flags still fluttered on the bell towers of the churches, but they looked lonesome up there and no one paid any attention to them that day. The Germans had all left their barracks, offices and guard posts, and departed for Montenegro. Shkodra was expecting the arrival of the partisans who had been waiting on Bardhaj Hill, in Postriba and on the other side of the Bahçallëk Bridge for the Germans to leave. That night, we heard several explosions that were so strong, they shattered the windows of many homes. A German motorcyclist had returned from the border crossing at Hani i Hotit to set off the mines placed under the bridges connecting the town to the plains. After these explosions, which marked the definitive departure of the Germans, no one slept a wink all night. There was a sense in the Franciscan Monastery where we were living that the West had taken an historic step at that moment and was abandoning us, and that in Albania, war would be declared on the Catholic Church, a struggle that would probably jeopardise the very survival of the Catholic population in the country. This was not unexpected by the Catholic clergy; one might even say they saw it coming. We had begun many years ago to prepare the young people, in lessons and lectures, on how to come to terms with the savage persecution that might climax in our extinction. During morning prayers, at five to six o'clock, the whole Franciscan community gathered around its leader, Father Mati Prendushi, and in fervent prayer, we sought salvation from the Almighty. The Catholic Church in Albania was in the Garden of Gethsemane. "Oh my Father, if it be possible, let this cup pass from me!" This was our prayer, but it was the will of God. At about 10:30-11:00 on that cold and sombre morning of 29 November, partisan brigades led by Major Gjin Marku were seen coming down the main roads into town. A red star had been added to the Albanian flag they were bearing. We observed them through the bars of the windows. It must be said truthfully that, with the exception of a few individuals known for being pro-communists, the Catholic population of the town did not participate in any celebrating, whereas most of the Muslim population, decked out in their finest clothes, gave the impression of taking part in a joyful occasion. The partisan army, garbed in various and sundry types of foreign army dress, was a very motley force - hungry, raggedy, and wearing sandals. All the greater impression was made, not by the clothing, but by the partisans themselves. What mothers could have given birth to such children with rifles slung over their shoulders? There was no way they could be accommodated in the barracks. They had no other clothing or even food with them. So the partisans were billeted with local families, three to a house, sometimes six or seven. The population took them in, fed them and became infested with vermin. They were not good people. They snooped around the houses, looking for Germans or for "reactionaries" in hiding. The first thing they did was to get the prisons back into working order and fill them to the hilt with innocent people. They gave the prisoners no food, so their families had to come and feed them, otherwise they would have starved to death. And the food brought by the family members went more to feed the hungry partisans than to keep their poor, tortured victims alive. Rumours soon began to fly that they killed X or Y, or that others had disappeared without a trace. Who was the head of this new government? The name of Enver Hoxha started to circulate, a figure completely unknown in northern Albania up to then. The new Albanian Government was constituted in the month of December. No one knew if it was a military or a civilian government. Its officials had high positions, but no real power. Power was in the hands of a wide variety of local partisan commanders now installed in other people's homes. The brigades in Shkodra were reorganised. Major Gjin Marku and the first wave of men were crossing over the border to provide "fraternal assistance" to the peoples of Yugoslavia. Shkodra was filled with partisan brigades. Everyone was surprised at where all the soldiers had come from, more men than even the foreign armies had had! The partisans said that they had come to chase the Germans right to Berlin, but they did not even have proper shoes on their feet. In general, they were not people one could discuss things with. Their behaviour was appalling. They gobbled down the food and broke the drinking glasses. Albania had witnessed many a foreign army, but never one like this. 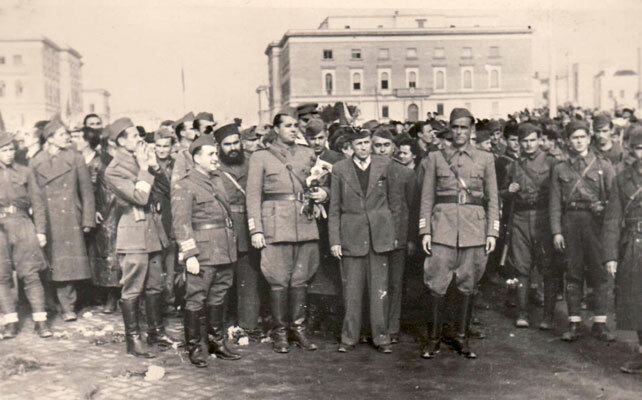 Right after 29 November 1944, there began an incomparable movement on the road from Shkodra to Podgorica, and this at a time when communication with Tirana was extremely difficult because the bridges were down. The rivers could only be forded on rafts with armed partisan guards. Albanians and Montenegrins crossed over the border freely and mingled as if there were no border at all. Where was the real power in Albania? It was the trobojnica (Montenegrin flag) that ruled the land. Masses of three-coloured Yugoslav flags were to be seen in the streets, on all government buildings, and on every house. How did they manage to find so many of those flags so quickly, flags that the population, fearing a new period of enslavement for the Albanian nation, looked at with disapproval? As soon as the schools were opened, all of them, without exception, began to sing the national anthem of that foreign flag: "Ej slovenski još živi," "co bajrak ne vije," "živi, živi jugoslovenski" and "ide druže Tito preko Albanije…, preko Albanije…" I do not know what that means or how to write it properly, but this is how I remember it from the time, with the melodies). Our national songs were no longer sung. Several days passed. It was only on the bell tower of the Franciscan church dominating the centre of town that no trobojnica had been raised. A sad-looking Albanian flag, but the real one without a star or pickaxe, still waved in the breeze all by itself. No one regarded it as their flag anymore. It struggled to survive the storms of that communist winter and, though torn and faded, it continued to fly. One day in December, two partisans knocked on the gate of the Franciscan Monastery. "We want to go up to the bell tower." The doorman called me because I was the one who went up the tower every day to fix the hands of the clock, from which all of Shkodra got the time. In actual fact, this was the duty of Father Filip Mazreku. He had put the Albanian flag up there on 27 November 1944, but because I was young and willing, he entrusted the keys to me. I ran to get Father Filip and informed him that two partisans were at the gate and wanted the keys to the bell tower. "Listen," he said, "I cannot stand the look of them. You know, they murdered my brother in Tirana without leaving a trace. We don't even know where he is buried, so that we could say a prayer for him or lay some flowers. You go with them. You've got the keys. But listen to me, don't leave them alone for a second. God only knows what they're up to." "We have been sent by the command to take down that rag flying from the tower. It's a disgrace," they stated, "for that rag without the partisan star on it to be flying over the main square in town!" "But we don't have any other one." "We have brought one with us, brand new! Look at it, it's the flag of our Yugoslav brothers and has a partisan star on it." "Two flags?" I inquired. "But we've only got one flagpole. We've never had two flags." "Well, you people put up the Italian flag, didn't you?" "What about the Vatican flag?" "Well, what shall we do then?" "We'll go back and get another flagpole. You wait right here for us." When they came back with another flagpole, they asked me for the keys to the bell tower once more. I climbed up to the top of the tower with them, above the clock, to where the flag was hanging. They were amazed at the view of the town below them. "Wow. Look how beautiful it is from here!" From that vantage point you could see all of Shkodra. When they had had their fill of the town, they took the flagpole off the holder and put the new flag out with the partisan star. Goosebumps covered my whole body. That heroic flag of the Albanian highlands, worn and torn, and now lay there like a corpse. When they tried to raise the Yugoslav flag, the pole would not fit into the holder. "Where can we put up the flagpole? It doesn't fit. Damn!" they said, and asked: "Do you have any wire so that we can attach it to the railing?" "No, I don't. But listen, even if there were wire, it wouldn't hold because it is stormy up here. You need a proper holder." "Damn it all," they muttered, "we really do need a holder. Why didn't you say that in the first place?" "I didn't know, I never thought of it." "Wait here, and we will go and get a mason." They climbed back down and departed, returning with the mason. He affixed two new holders on the tower. On the side opposite to the Albanian flag now flew the Yugoslav flag. We had two flags." The new power base, the Committee of the Party, was down in the city centre, in the recently constructed house of the businessman, Zef Koka. The two hooded partisans shouted down to someone on the ground. This person, standing out on the street, was giving instructions with his hands. They removed the flags once again and changed their positions. Where the Albanian flag had flown was now the Yugoslav flag. On the other side was the partisan flag, but it could hardly be seen because of the apse of the church. "Have you got the keys of the bell tower?" "Yes, Father Filip gave them to me to regulate the hands of the clock." "Were you the one who hoisted the Yugoslav flag?" "No, not at all. Two partisans came and put it up." "Did you not know," he continued, "that the flag of Scanderbeg was first hoisted on that spot on 12 June 1913 and that the brothers defended it with rifle in hand? Did you not know that Father Gjergj Fishta was condemned to death because of that flag? Did you not know that even the Montenegrins, when they entered Shkodra in 1915, did not dare to remove the flag? And did you not know…"
"Father," I interrupted, "I know all that. The men who put the Yugoslav flag up were two partisans who came with rifles, sent from the command. What could I have done? Fight with them over it?" "No, no, I'm not saying you are to blame. But it's a disgrace! If it had only not come to this! How can the Yugoslav flag be flying from our church steeples? Oh Lord, behold and judge!... Non-believers only think of their own personal gain. And what did the partisans say? Were they impressed when they saw the Yugoslav flag flying?" "They said they were just carrying out orders from the command. In fact, I heard them say they wanted to install a machine gun up on the bell tower." "Yes, a machine gun, because you can control the whole town from the tower." "We have always known what kind of freedom the Serbs have given us! But what kind of Albanians are these partisans working for the Slavs? They have sent our sons off to be killed there. Poor Albania, that's fallen into their clutches!" Normal life in town was paralysed. There was no more travel or telephone, no shops or businesses opened, no government offices or official records. On rare occasions, a piece of paper stamped with a partisan seal could open doors. Albania was petrified and had fallen into a coma. Educated people did not know what to do. The uneducated had taken power, and this was only the start. Several days later, military operations began in town with identity checks and searches. All the houses in town, without exception, were searched by armed partisans, every nook and cranny, every chimney and basement. On the pretext that they were looking for 'criminals' and 'reactionaries,' they strove to spread terror throughout the population. In almost all cases, the searches resulted in imprisonments and executions. To escape the terror, many people fled into the mountains and joined the illegal opposition, or hid in the home of a trusted friend. Punishment for anyone sheltering 'reactionaries' was terrible torture and execution. This sometimes even occurred in cases where one person's name was the same as the person being sought. Most of the men, soldiers and civilians, who carried out these searches were virtually illiterate. In early December 1944, a group of 7-8 important figures arrived at the Franciscan Monastery in Gjuhadol. Among them was Kolë Jakova and it was said that their leader was Nako Spiru. They brought orders with them for the closing down of our religious periodical Hylli i Dritës (The Day-Star), and of all other religious periodicals, Zani i Shna Ndout (The Voice of St Anthony), Zgjimi i djelmnisë (The Awakening of Youth), Bijat e Zojës (The Girls of Our Lady), etc. They shut down the printing house and all religious organizations. The men paid a 'visit' to the library and museum of Father Shtjefën Gjeçovi. Kolë asked for Gjeçovi's ring. It was said to be from ancient times, probably from the first century, and was made of gold, crafted with great mastery. On it was a large gem, far too large for the ring itself. They say that a representative of the British Museum had once offered to buy it for 14,000 pounds sterling. Kolë confiscated it, leaving us with an official receipt. The grim measures introduced to terrorize the population got worse and worse in the months of January and February 1945: identity checks increased, more people were imprisoned, there was more torture, more executions. Almost every evening after dark, organized groups would parade down the streets howling with fury and singing songs to terrorize the population, such as "Vengeance for the Youth!" The same fate awaited the villages in the surrounding area. No foreign occupation had ever caused more suffering to the Albanians than this group. We received news that Dom Lazër Shantoja had been caught while in hiding with Dom Ndre Zadeja in Sheldi. Dom Ndre Zadeja was then shot, the only reason being given was that he had sheltered a colleague in his home. Both of them were Catholic clergymen and writers. Dom Ndre Zadeja had studied in Austria. He was much admired by young people in Shkodra for his plays on legendary and historical subjects. Dom Lazër, a priest from Shkodra, was a man of learning and of rare talent as a public speaker. He had been politically active and was one of the main editors of the opposition newspaper Ora e Maleve. When Zog took power in 1924, he was forced into exile. He found asylum in Switzerland from where he returned to Albania in 1939, working thereafter for cultural institutions. The communists regarded him as a fascist and so he fled to Sheldi. After they arrested him, they tortured him barbarically and finally shot him. In the early months of the year they also arrested Father Gregor Lumaj who at the time was parish priest in Berisha, and accused him of being a sworn enemy of communism and of having prevented its spread in the Puka region. This humble father had spent all of his life in the mountains of Dukagjin and Puka, and enjoyed unquestioned respect among the people in the mountains because of his sincere devotion to them. He was also an expert in their customs and in customary law. One morning, the Franciscan Monastery in Gjuhadol found itself surrounded by partisans. This was the first search to be conducted. We were all assembled in the main reception room and our papers were checked as other partisans rushed through the corridors, searching the rooms. When the search was over four or five hours later, and we were permitted to return to our rooms, we discovered that everything had been turned upside down. They had taken all the typewriters, cyclostyles, radios, field glasses and photography equipment. From the Shtjefën Gjeçovi Museum they took all the old filigree weapons and the rifle that Gjeçovi had carved and fashioned of his own hand. Of course, many of the smaller pieces of fine furniture were missing, too. This type of 'search " became standard for all of the city of Shkodra, and every raid resulted in many arrests. It happened to the monastery many times. The city was living days of fear and trepidation. One day, our Franciscan Superior, Father Mati Prendushi, mustered his courage and asked for a meeting with the commander, Shefqet Peçi. He spoke to him normally as would a prophet to a king, informing him candidly that the behaviour and actions of the partisans were uncouth and unacceptable. He reminded him of the inviolability of ancient monuments of culture and art because they were part of the national heritage of the Albanian people and must not be touched by anyone, and asked for the objects taken to be returned to the museum as quickly as possible. Shefqet Peçi listen to the brother attentively. He then explained to him that information had come in, alleging that the Franciscan Monastery was sheltering the war criminals who headed the former government, such as Father Anton Harapi, Mehdi Frashëri and his son, Ibrahim Biçaku, and Lef Nosi, etc. Father Mati made it clear that these figures had been at the Franciscan Monastery while they were in power, but had departed either before or during the withdrawal of the German Army. Shefqet Peçi then promised Father Mati that he would issue an order for the partisans to behave properly. There was much tension at the time because Kelmendi territory would not submit and was putting up so much resistance that the survival of the new government in Tirana was in jeopardy. He stated that he would be serving as commander of the "Comrade Mehmet Shehu" Operation and would convey to it his positive recommendations for them and the Franciscan Monastery. "What do you young people think about these matters?" I replied that real internationalism could not be brought about by oppressing nationalism." "That's the most reactionary part of the country," he replied. "God be with you! Stop, do not spill one another's blood. Oh, Gjon Martin Lulati, I order you in the name of Christ to lift the siege! And you, partisans, go away and leave the people here in peace and quiet. Consider well what I have said for we are all Albanians and brothers!"